A U.S. Forest Service ranger discusses nature conservation with Scouts and Venturers. 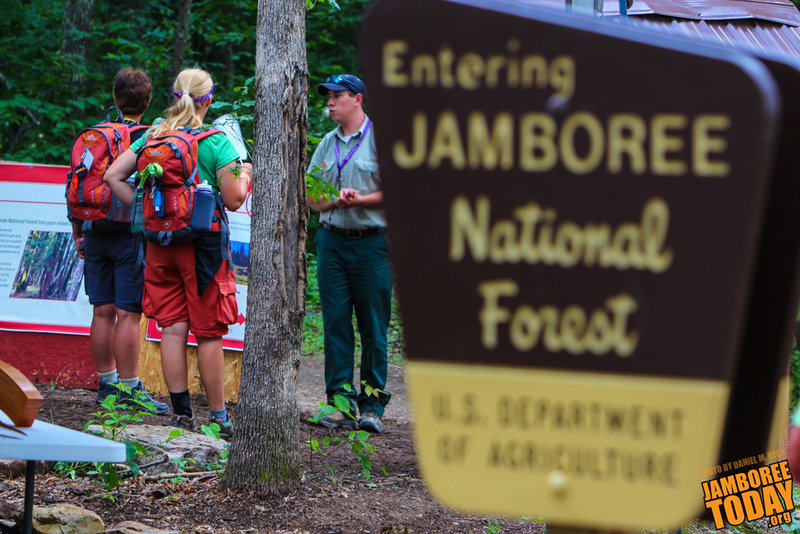 The jamboree site is declared a U.S. National Forest for the duration of the event. Photo by Daniel M. Reck. Jonathan Rose and Alex Lebowitz, both of Cincinnati, Ohio, were in a quandary on Thursday. The two Scouts were at the Outdoor Ethics area wondering how to spark interest in the principles of Leave No Trace in Troop 194 of Mason, Ohio. Rose, a Life Scout, says he had been camping for years when he found something online about an LNT training course. Lebowitz discovered LNT in school while researching a presentation on Venturing. The longtime friends both attended the course. Rose described the training as eye-opening while Lebowitz says he learned of the depth of LNT's seven principles — not just the words of the principles themselves. Now, the pair wants to spread the LNT message and culture to their troop members. What to do? They say Outdoor Ethics staffer Dale Long's advice was to plan games and activities out of an LNT book titled 101 Ways to Teach Leave No Trace; have troop members participate in National Trails Day service projects; and find teachable moments — times when an opportunity suddenly presents itself for on-the-spot outdoor education. Rose and Lebowitz seemed richly satisfied by their discussion with Long, who says he volunteers at the Outdoor Ethics area to inspire others about doing the right things in the backcountry. "If they can discover how they feel about the topic, after he speaks with Scouts, I feel that we've won," says Long, who oversees 95 LNT trainers in the San Diego Imperial Council. How can a Scout, Venturer, or Scouter at the jamboree get answers to important questions about the Boy Scouts of America's Outdoor Ethics program? To find the Outdoor Ethics site from Boulder Cove, walk uphill from Goodrich Lake and the causeway across a wooden bridge. A short distance from the bridge, you'll find Outdoor Ethics — literally and figuratively. Directions are necessary because, well, the conservation trail is off the beaten path. Apparently some participants have had trouble finding it, although once they get there, they find the conservation trail, which includes Outdoor Ethics, is nestled in an idyllic outdoor setting, bordered by an inlet of Goodrich Lake. The conservation trail has demos and displays by state natural resources agencies, the National Park Service and the U.S. Forest Service. While Outdoor Ethics is a station along the trail, it's also an umbrella BSA program — one so new that few know about it. And it has three pieces to it: Outdoor Ethics the program includes Leave No Trace, Tread Lightly, and a land ethics portion. Leave No Trace espouses seven principles to soften backcountry groups' impact on the environment while Tread Lightly, with its five principles, promotes responsible mechanized recreation. The third part — land use — keys off of the BSA's legacy Outdoor Code, which shares ideas with LNT, but decries littering and supports the conservation of wildlife and natural resources. Land use also invokes the philosophy and research of Aldo Leopold, who is considered the founder of the science of wildlife management. Another view is that land use is "our ability to heal the land," but several Outdoor Ethics staffers here agree that the concept of land use is an evolving one. Long, who says he seeks to inspire Scouts and help them discover new things, seemed to enjoy his extended discussion with Rose and Lebowitz. Those who want to know more about LNT and Tread Lightly can visit the Leave No Trace Center for Outdoor Ethics and Tread Lightly tents, both of which are next to the BSA's Outdoor Ethics area. Not to be missed is the display on Low-Impact Hammock Camping, which is part of Outdoor Ethics. Slipping into a hammock Thursday was Catherine McNutt, a Venturer from Beavercreek, Ohio. "I think it's pretty cool," she said of the hammock she relaxed in, although she added, "It was tricky to get into."